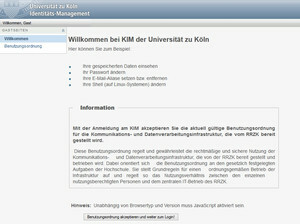 All students of the University of Cologne receive a PIN with their documents at the matriculation. Accept the accommodating arrangement to go on with your registration/password change. In case you end the process at this point, you have to wait for five minutes to retry. 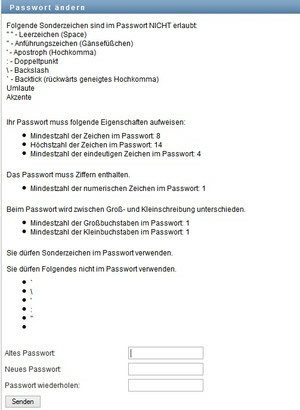 Read the rules concerning your password carefully and set a new one. On the following page you can see your account information. Note the displayed user name. Please use this name to log in at the services of the University and uniKIM. You can also check all saved data about you. 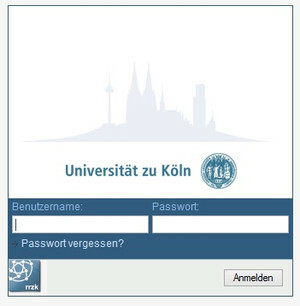 The student account is valid for the time of you being matriculated at the University of Cologne. It will be deleted after your exmatriculation. Eine Video-Anleitung zur Freischaltung des Studierenden-Accounts haben wir Ihnen bereitgestellt.